Spock's look was carefully tailored to bring in the ladies. The popularity of Star Trek obviously did not fade after the original television series' cancellation in 1969. After this sad occurrence, Star Trek creator Gene Roddenberry remained in the demand of thousands of fans. In what was probably one of many, a letter response to what appears to be one of these fans has been uncovered that shows insight into the creation of the character known as Spock. The vulcan logic master wasn't given pointy ears just to differentiate him from the other races in Star Trek. 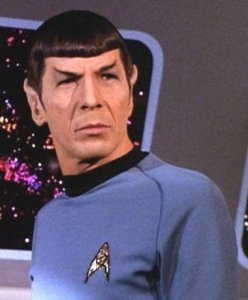 Those slanted eyebrows weren't only meant to give Spock a stone-cold stare. It turns out that Roddenberry created Spock's look partially to entice women into the show. In the letter found at Letters of Note addressed to one Miss Judy Thomases, Roddenberry covers quite a wide range of topics. On Spock, he writes: "We did think Spock became very interesting to fans, I did purposely give him a slight look of the 'devil' because I thought that might be particularly provocative to women, particularly when his nature contrasted so greatly to this." If you really look at him, Spock does have a look that could have easily fit as Captain Kirk's arch nemesis, but instead he was a happy, helpful "devil." Captain Kirk is often thought of as Star Trek's hunk, but Spock was evidently meant to be a late 1960s bad-boy of television along with him.